I met Amie Valpone in New York a few months ago, at the International Year of Pulses launch party. I was surrounded by people I didn’t know and feeling a little shy, and Amie bounded up and introduced herself, bubbling over with enthusiasm. I was so glad. She kept referencing how sick she had been—a decade of chronic illnesses (lyme disease, hypothyroidism, leaky gut syndrome and more) slowed her down immensely. She is finally cured after seriously detoxifying her life, from the products in her home to the food she eats. I had a hard time imagining this vivacious woman with glowing skin being sick and bedridden, but I could sense by the passionate tone in her voice that her illness and recovery were both very real. The motivation behind her website, The Healthy Apple, and her new book, Eating Clean, is to help others get better and feel better. She sent me a copy of her book, which is full of solid information and practical advice for detoxifying our homes and diets. I like to think I run a pretty clean operation over here, but she has inspired me to do even better. I can’t wait to make her simple (and cheap) cleaning solution of orange-infused vinegar. Her book offers over 200 simple and healthy recipes (that’s right, 200!). The chia seed pudding in the breakfast chapter caught my eye, and I enjoyed it so much I just had to share it. I’ve tried chia seed “pudding” before and just couldn’t get behind that oddly gelatinous texture. Amie’s version, however, is blended with cashews and dates for ultra creamy pudding. She added a swirl of chia gel to hers, but I think I like mine best all creamy. It’s up to you. In case you aren’t familiar with chia seeds, they are the same seeds that grow long and green on Chia Pets. They’re a South American super food full of fiber, protein, Omega-3s and minerals. They plump up into little gelatinous balls when they rest in water. You can see them floating around in bottles of kombucha these days. This pudding is the first time I’ve ever truly enjoyed them, so thank you, Amie! This pudding is energy dense, so it is a great breakfast option. It’s so rich, creamy and decadent, though, that I’d serve it for dessert, too. I loved it on its own, and with some leftover berries from a cookbook shoot on top. Any fruit with tropical vibes would be especially welcome. I tried stirring in some cocoa powder and mini semi-sweet chocolate chips (pictured in the last photo), and it reminded me of a Frosty crossed with the instant pudding cups of my youth. So good. If you (or someone you know) could benefit from cleaning up your diet and home, be sure to pick up a copy of Amie’s book, Eating Clean! Creamy chia seed pudding made with cashews, dates and vanilla! This treat is much healthier than traditional pudding. Find a chocolate pudding option, too. Recipe yields 3 to 4 small servings. Fresh fruit: berries, sliced bananas, chopped pineapple, etc. Sprinkle of cocoa powder, mini chocolate chips or finely chopped dark chocolate, toasted coconut, cinnamon, etc. In a liquid measuring cup, combine the water and chia seeds. Set aside until the mixture forms a gel, about 20 minutes. If your dates aren’t soft and plump, place them in a bowl and pour hot water over them. Set aside for up to 20 minutes, or until the chia seeds are ready. Drain. Pit the dates. In a blender, combine the pitted dates with the cashews, cinnamon, vanilla and salt. Pour in half or more of the chia gel (I prefer chia seeds in their blended state, so I poured in almost all of mine). Puree until smooth. If your pudding gets warm in the process, you’ll need to chill it until cool. Serve individual portions of pudding with any remaining chia gel swirled in. Top with any garnishes you’d like. Store leftovers in the refrigerator. Recipe adapted from Eating Clean, © 2016 by Amie Valpone. Reproduced by permission of Houghton Mifflin Harcourt. All rights reserved. Chocolate pudding option: Stir in cocoa powder, to taste (a little goes a long way). Add some mini chocolate chips or finely chopped chocolate if you want to go all in! Yum. Looks delicious! And The Healthy Apple site looks great and will start following it too. Thank you for sharing this Katie. Do you know if there would be a replacement for the cashews. We can’t have nuts…I would love to try this. Tofu maybe? It’s worth experimenting with if you cannot have nuts. I found a few recipes on “tofu chia pudding” that you can probably use to modify this recipe here. Instead of cashew I put cashew milk. It’s delicious !!!! Cashew milk comes from cashews. ARW needs a nut substitute so cashew milk would not work for ARW because cashew milk is a nut. I just used Hemp milk instead of the water and the nuts. I turned out perfectly!! Thank you for the delicious and nutritious recipe!! I wonder if avocado would work instead of nuts, Carolien said in her post she replaced the cashews with tahini, I might try this too as I can’t eat soya. I wish I knew exactly what to suggest. Raw sunflower seeds might work, if you can eat those! I’ve seen chocolate avocado puddings around, so you might be able to sub avocado and add lots of chocolate to mask the flavor. just dont put the nuts in or use a dried fruit..
Well, I think maybe I will take the plunge and try these Chia seeds. I read so much about them but shy away for various reasons, mostly fear of the unknown. I’ll put some in my grocery trolley tomorrow! This looks delicious, Kate! I love all things chia, but yes, I definitely agree with the fact that the sometimes gelatinous texture can be off-putting when prepared in certain ways. Thanks for sharing! Yum! This looks like a breakfast that will actually keep me full until lunch. Could we substitute cashew butter or another nut butter for the cashews if we don’t have a high-powered blender? Hey Jenna, that’s a good question. Probably? You would need maybe 1/2 cup cashew butter to replace the cashews. You’ll still need a decent blender, though, to cut through the dates and thick chia gel. Have you had any luck with soaking cashews and blending them? Tried soaking and blending cashews, amazing. This looks so interesting, especially for a pre-prepared breakfast! Do you know how long it can store in the fridge for? Hi Aby! It should last about four days in the fridge. That’s how long things tend to keep well, anyway. I found that it developed a bit of an oxidized skin on top, so to prevent that, you might want to press plastic wrap directly against the top. Oh this looks amazing! I’ve been living on chia seed pudding the last few weeks, but I never thought of making it with something else than water or non-dairy milk. I don’t dare to make this during weekdays as I’m afraid the blender will wake up the neighbours (at half past six…), but this looks like the perfect Saturday morning breakfast. You’re so thoughtful, Evelyn! It would be a perfectly decadent Saturday breakfast, for sure. Haha thank you! It’s mostly because I absolutely HATE being woken up when I don’t need to get up, and I figured I’m not the only one. Made your chia pudding yesterday and it turned out, as always, to be absolutely delicious! It’s so rich and creamy, and I do like the combination of partly blended chia seed and partly gel. Thanks for the recipe and the topping ideas! Mary Ann and 8 collies! That's right, 8! Hope you love it, Mary Ann! This is so clever! I cannot seem to get on board with traditional chia pudding… it’s the texture. But the cashew cream could make me a believer! I love how your blog stretches what I would consider making. 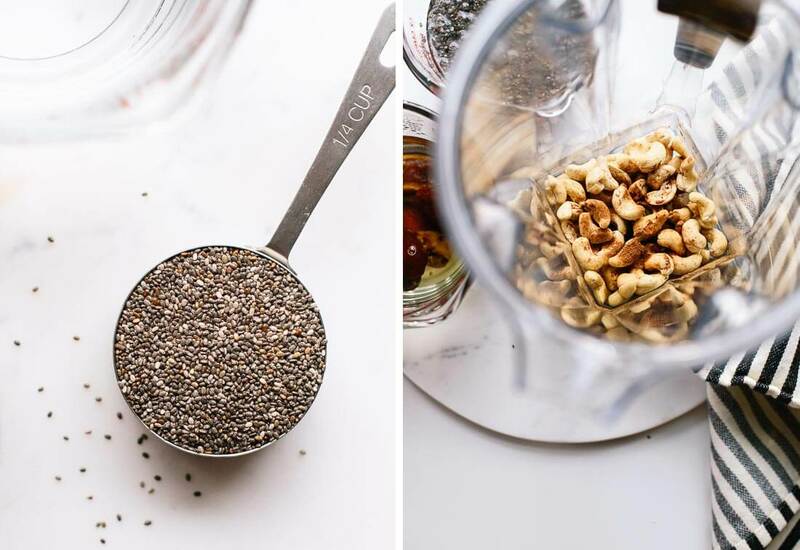 I would never have thought to use chia seeds for anything – they don’t seem like they would have much flavor – but your recipes are always so good that I am putting this one on the “to try” list. I am always looking for a delicious, energy-packed breakfast. 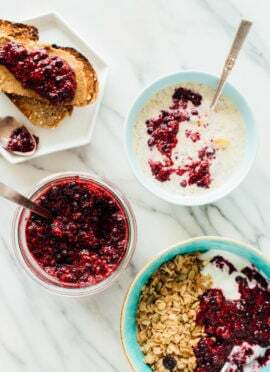 I started making simple overnight chia pudding regularly so I will have to integrate this into my weeknight dessert planning :) I love your pictures and recipes Kate…they make me so happy! I can’t wait until your cookbook comes out! This looks great! Love that there’s no refined sugar – the dates will do the job. Can’t wait to try it. Thanks! Thanks, Heather! Hope you love it! I just made it, and because I did not have cashews at home I replaced that with … tahini (=sesame paste). The result is delicious! PS; for breakfast with one banana one portion would fill me up. Otherwise I would definitely need 2 (I run 4 x a week so can eat a little more). I love tahini in smoothies, so I bet it made some great pudding! Thanks, Carolien! I love that the texture will be different. I’m o.k. with chia pudding, but creamy sounds so much better. I sent this to my daughter for my granddaughter who can’t have any refined sugar or dairy, or a million other things. It’s pretty hard for a 7 year old with serious diet limitations in this world. A little pudding might help! I’m a fan of the creamy kind, that’s for sure. I was making instant pudding after school at your granddaughter’s age (which is full of soooo many terrible things). I really hope she enjoys this one! I made this with tahini (mentioned by a previous commenter) since I didn’t have raw cashews, and it is DELICIOUS! I used my NutriBullet to get a really smooth, creamy texture and portioned it out into little quick to grab containers. Oh Kate this sounds delicious! And I love the idea of pudding-afying it by adding some cocoa and chocolate chips! yum! How beautiful! I love how you topped the pudding with the colorful berries! This sounds so divinely creamy and delicious! I’m always looking for fun ways to use chia seeds! Right up my alley! Going to try this tomorrow. I may plump up my dates with cold infused oolong. This pudding, omg, there are no words for how yummy it looks! Just made this pudding – DELISH! I found myself trying to get every last bit out of the blender with the spatula after I poured it into containers for the fridge. That’s the sign of good eats! Thanks, Bridget! So glad you enjoyed it. I was really happy to find this recipe in Amie’s book! This looks so delicious! Great use of chia! Made this last night and the kid finished it for dinner today. Made another batch just now and stirred in a small amount of cocoa powder and carob chips and it was creamy and filling and delicious! This will definitely be doled out into mason jars and brought to work with me. Thanks for the great recipe!! This looks so delicious, could almost taste the creaminess, 100% giving this a go and will of course shout you out on social media! Thank you for your lovely recipe and inspiration :) Look forward trying out this recipe. I adore chia seeds in any way, shape or form so this one will be another addition to my recipes! 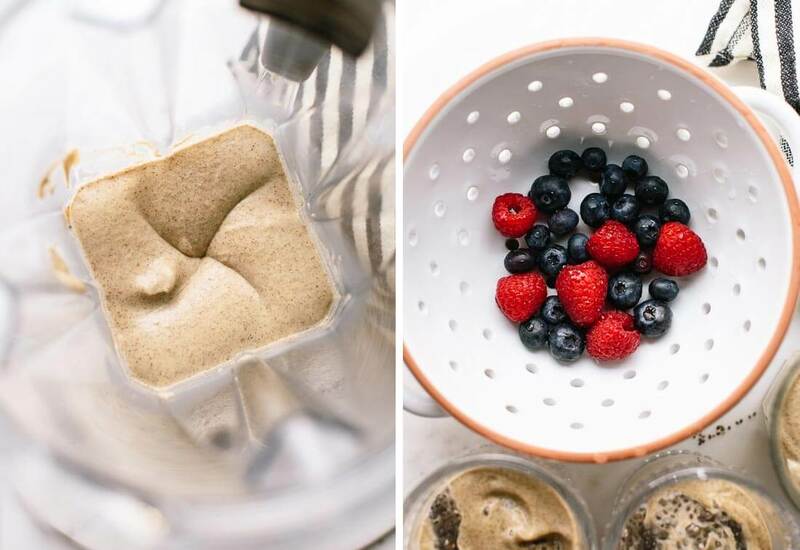 I love the idea of blending it with cashews and dates! Sometimes I’m just not all about the jelly texture of blended chia pudding, but I bet this one is so creamy. Definitely trying! I need to cut down on my refined sugar and saturated fats for real, so this seems like a healthier treat! Thanks for the recipe! 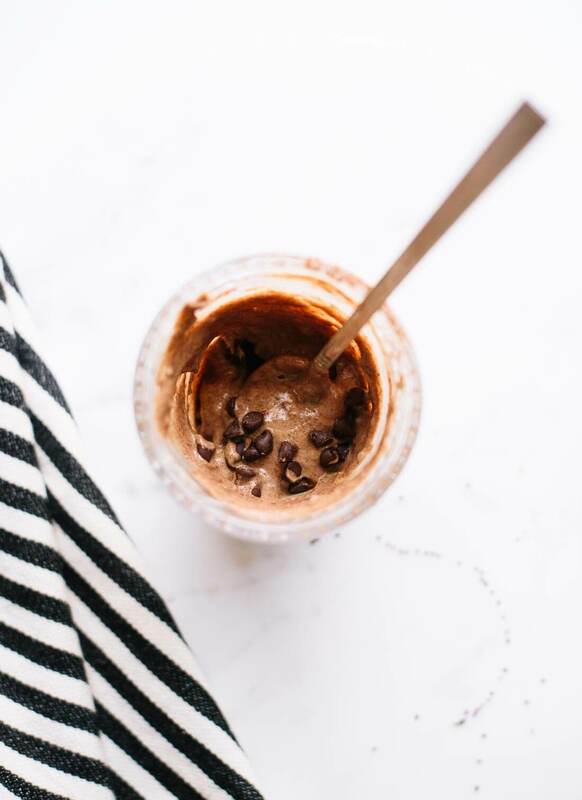 I totally agree– I’ve always had a hard time getting behind chia pudding but this is a total exception! I’ll have to try it out. 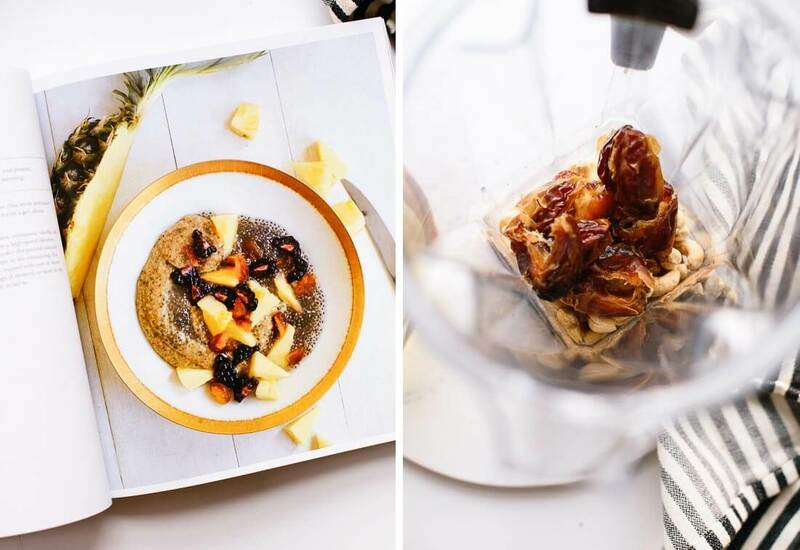 My stomach is very sensitive to chia but my boyfriend loves this recipe and I would like to adapt it so I can enjoy it too. Do you think I could sub flaxseed for chia? Would it be 1:1? Hi Hannah, flax would alter the flavor, but if you like the flavor of flax, that might be ok. I’m really not sure how flax pudding would work out. Let me know if you try! Oh my, this was absolutely delicious. I have made a yummy coconut lime chia seed pudding before, but this was a fun twist and gave me a new way to play around with chia seeds! Thanks, Kate! Amie is so awesome! <3 I made this chia pudding as well and LOVED it. The cashew cream is perfection. Sounds amazing!! Need to try this ASAP! Thank you SO much for sharing this recipe from my cookbook, Kate. I am so grateful for your support and this post is absolutely beautiful. Thank you for your kind words and for being so amazing. I’m so happy we met and I’m delighted to see YOUR book soon, too. Thank you again. Have a beautiful week! Sending you so much love and a big hug from NYC! YUM! Absolutely delicious. I have steered away from chia seeds up until now and sheepishly admit the magic of this seed is real. This recipe has me hooked. Better late than never to the chia party! Great articles and lots of great information in improving our food photography! Thank you for all the tips. Goodjob! Made the chocolate version, it was really good and easy. I wonder how this would be if part or all of the water was replace with canned coconut milk? This looks absolutely delicious! I just wanted to know if you used the fresh dates or died ones? I am assuming fresh? Thank you, Carol! I’m so glad you enjoyed this one. Dates are high in sugar, but that’s why they’re so tasty. :) They’re also high in fiber (so are chia seeds), which should slow sugar absorption and prevent spikes in blood sugar. I have never tried barley rice malt before! This looks great. Any other nut other than cashews can be used here? My son gets a weird rash on his face from cashews and walnuts. Almonds? Macadamia? This was just the high protein snack/lunch I was looking for for my kids. They don’t like the chia seeds whole so blending it all together is just brilliant:) Thank you. It’s delicious! I’ve made this recipe several times and it is a delicious treat! I add some Coconut oil to it to give it a bit more texture and richer flavor. 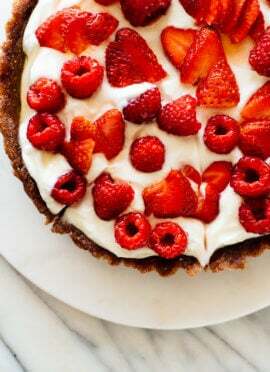 Also love to serve it layered with berries, bananas, coconut flakes and ground flax seed for a super-healthy treat! Love chia puddings! Thanks for sharing yours, it looks delicious. Will definitely give this one a try. I just finished a bowl of chia pudding for my breakfast this morning. It really is fabulous stuff. 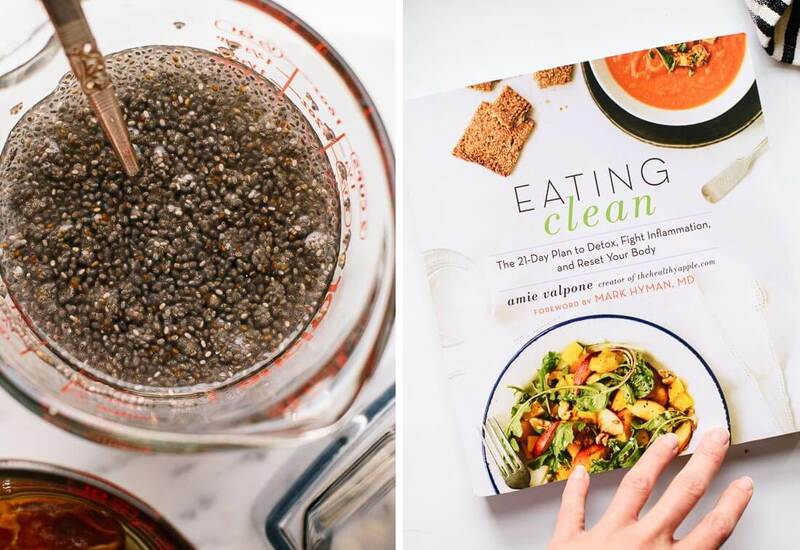 I’ve never been a big fan of my past experiments with chia, but this…omg, THIS is amazing. Thanks for sharing as this is most certainly a new staple in this household. So happy this worked out well for you, Randi! Can I ask– what kind of milk did you use? It seems as though readers are getting mixed results! I used water to make your recipe as written. But for my next batch (later this week), I’ll try not-canned coconut milk just to see if there’s any improvement. I imagine the kind of dates people use are also a variable. I used extremely fresh, plump dates from a middle eastern market. this is really good! I’ve tried quite a few Chia recipes and this tops the list! very easy to make and it is delicious. thank you for sharing. That’s great to hear, Monika! This one has been tricky for some, so I’m glad it worked out well for you. I have a vitamix. :) It gets me through a lot. This was my first time ever making Chia pudding! And it is so freakin’ awesome!! Thanks so much for finding and sharing this recipe! Yay! So glad your first experience was a great one, Laura. 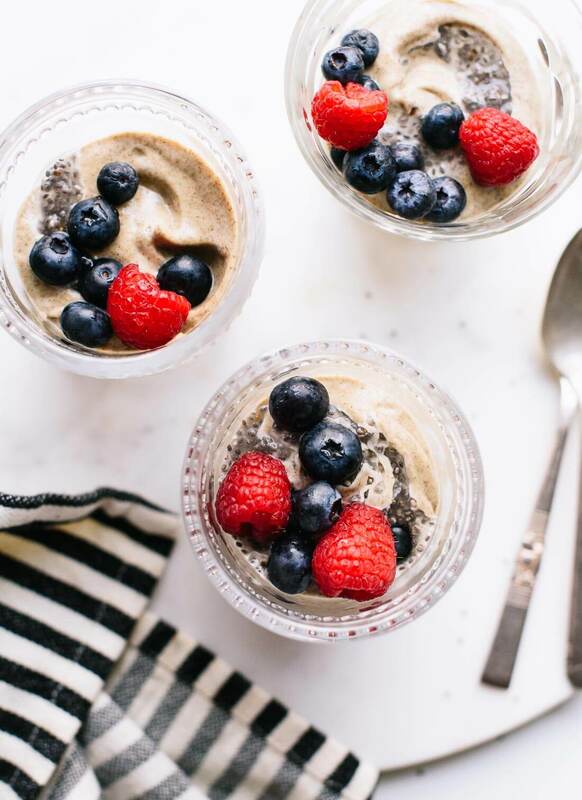 This is one of my fav chia pudding recipes – especially with summer berries! I’ve made this recipe multiple times as written, but was out of cashews today and tried it with what I had on hand – dry roasted and unsalted almonds – and it still came out great. Wonderful! I’m glad the almonds worked well, Lauren. I’ve made this once a week for the past 4 weeks, it is delicious and my husband also enjoys the flavor. The only thing that I think is important for others is that you really need at least half of the soaked chia to achieve the smooth pudding flavor… even with a Vitamix. My husband and I actually like the texture of the chia ‘pearls’ but found that we are limited in how much can be leftover to stir in to the cashew/date/etc mixture. Thoughts on blending all ingredients (including water) first and then stirring I’m the chia seeds to soak for anyone that prefers the chia non-blended? 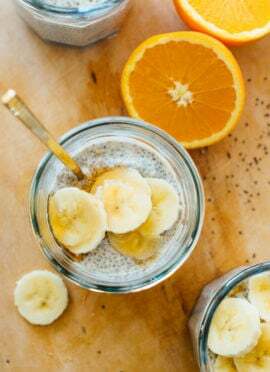 I may try that next time I make it as I used to just make chia pudding with unsweetened almond milk and chia seeds so seems like a similar concept but with a whole lot more flavor. I love this recipe! Now is my favorite way to prepare the chia It is so good! Thank you for sharing this recipe! Thank you for this delicious recipe! I had to substitute 1/2 cup raisins for dates as I forgot to buy dates. Also, I left out the salt and vanilla extract b/c I ran out, and it turned out so well! After blending soaked/soft nuts and raisins in the food processor, I transferred it to a blender and combined all of the chia seeds/gel and it whipped up like a smooth creamy dessert or breakfast treat. I love this recipe! Thank you, Mariah for sharing! I appreciate the review. This was soooo delish! Used almond milk instead of water and added 1/4 cup of unsweetened shredded coconut. Mmmmmm mmmmmm! Ok wow! I don’t normally comment on recipes but this tastes just like a yummy cookie dough! Creamy, but with a lovely texture. 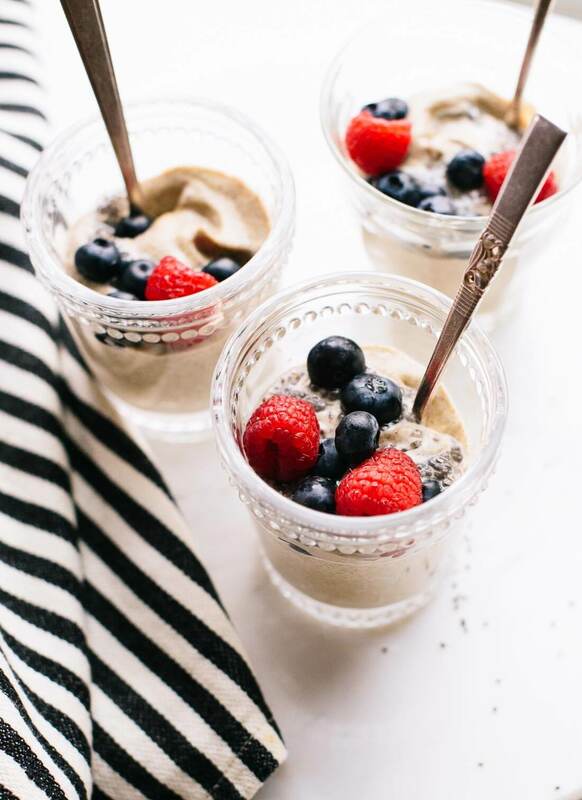 Not gelatinous at all like other chia pudding recipes I’ve tried – the cashews are brilliant! Thank you so much for sharing! This one is a keeper! Hi, Looks yum but i only have chia powder in the cupboard. Can I use this instead? I would stick with chia seeds! It really makes it. Amazing! Added 2 Tb cacao powder and a bunch of chocolate chips and it tasted just like a dairy-based chocolate pudding! Delicious, Mary! Thanks for your review. I have never really enjoyed the texture of chia pudding, it never felt substantial enough to me. This, though, is creamy, dense (in a good way), and filling enough for breakfast. I added a little extra cinnamon, a wee bit of grated nutmeg and served it with toasted sliced almonds, banana slices and frozen wild blueberries. Its really really good. This was so delicious! I cannot believe that this has these ingredients, it is the best healthy dessert I have had! I’m glad you loved it, Emily! what can I substitute cashew with in this recipe? My family is allergic to all nuts and also dairy products. We are vegans. I love pudding and am always up for new variations. My batch turned out grainy, and I am wondering whether I should have soaked my cashews more? I have a ninja blender, which I think is a pretty powerful blender….I did like the flavor, so would like to give it another go. I’m sorry this didn’t get quite as creamy! I would recommend blending it a little more if you can. Or, if you feel like it needs just a tad more liquid. That could help. I’m glad you finally had it, Kate! Thank you for your review. Love this recipe!! Reminds me so much of the rice pudding I had as a kid but healthier!